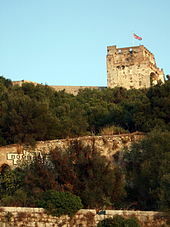 View of the northern face of the Moorish Castle's Tower of Homage. Built in the १४th century, it is the only Marinid construction outside Africa. 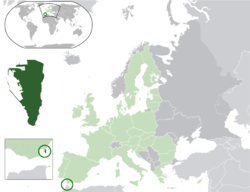 ↑ "Gibraltar: National anthem", CIA World Factbook, Central Intelligence Agency, "National anthem: name: "Gibraltar Anthem" . 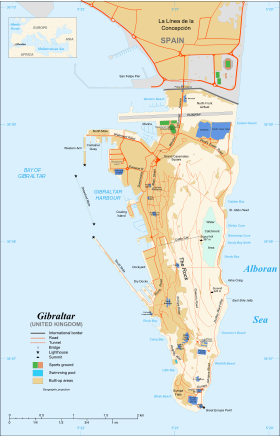 . . note:adopted 1994; serves as a local anthem; as a territory of the United Kingdom, "God Save the Queen" remains official (see United Kingdom)"
↑ Gibraltar was captured on 24 July 1704 Old Style or 4 August 1704 New Style. ↑ The treaty was signed on 31 March 1713 Old Style or 11 April 1713 New Style (Peace and Friendship Treaty of Utrecht between France and Great Britain). ↑ "BBC Weather | Gibraltar", BBC News, 29 January 2010. अन्तिम पहुँच मिति:6 November 2011.